GANGNEUNG, Gangwon Province -- The South Korean delegation for the 2018 PyeongChang Winter Paralympic Games officially disbanded on Monday after finishing its 10-day action at home. The ceremony to mark the end of South Korean athletes' Paralympic campaign was held at PyeongChang Athletes' Village in PyeongChang, Gangwon Province. Some 100 athletes, coaches and officials attended the ceremony, honoring their hard work and achievements at the 12th Winter Paralympics. "You all made history in the country's disabled sports by winning the most medals at a Winter Paralympics," said Korean Paralympic Committee President Lee Myung-ho. "But regardless of medals, you are all victors and champions. I want to say thank you and that I'm proud of you all." 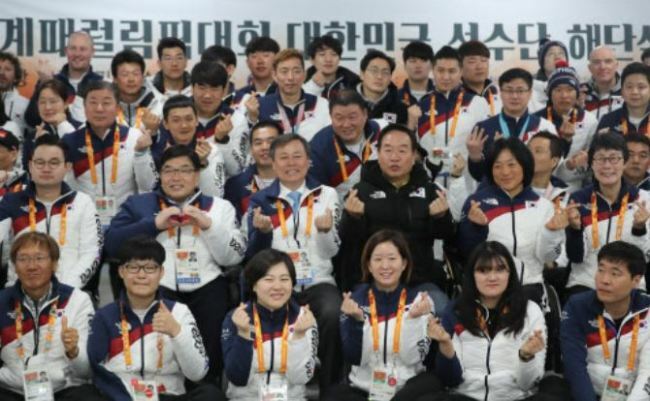 Led by chef de mission Bae Dong-hyun, South Korea sent its largest Winter Paralympics delegation ever, with 36 athletes competing in all six sports. They collected one gold and two bronze medals finish 16th in the medal standings, South Korea's best-ever performance at the Winter Paralympics. South Korea fell short of reaching the original target of one gold, one silver and two bronze medals for a top-10 finish, but it was still meaningful as the country grabbed its first Winter Paralympic Games gold, won by para Nordic skier Sin Eui-hyun in the men's 7.5-kilometer sitting cross-country skiing. Sin also took bronze in the men's 15km sitting cross-country skiing, while the ice sledge hockey team also earned bronze. South Korean Sports Minister Do Jong-hwan called the names of all 36 athletes before delivering his congratulatory speech, saying he really wanted to thank them for their efforts.